In May of 1856, when Southern Congressman Preston S. Brooks caned Massachusetts Senator Charles Sumner on the Senate floor, he shocked the nation and shattered the fragile truce that had existed between North and South. Part of the American Stories series, Benson's book introduces students to this key turning point in the coming of the War and as one of the most pivotal moments in American history. Because its story incorporates so many of the era's key issues like slavery and abolition, personal liberty laws and state rights, "Bleeding Kansas" and territorial expansion, ideals of gender and manhood, competing visions of labor and the economic order, and the revolutionary shift between the Whig-based "second party system" and its Republican-dominated third party successor, it provides an excellent window into the mind of a nation on the brink of conflict. These broad implications and the incident's inherent drama make this a natural topic for the American Stories series. The passionate language and sharp controversy of the collection's editorials and speech excerpts should appeal to a wide range of undergraduates. 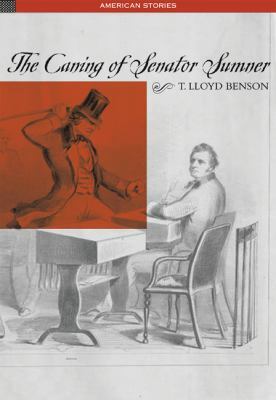 The narrative is complemented by a number of graphics, including images of the incident and maps showing the politics and intellectual geography of the era and how they were affected by the incident.Benson, T. Lloyd is the author of 'Caning of Senator Sumner', published 2003 under ISBN 9780155063471 and ISBN 0155063472. Loading marketplace prices 19 copies from $13.83 How does the rental process work?